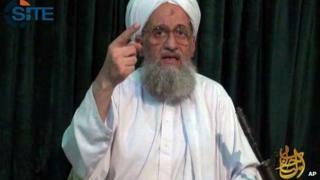 In a video message, al-Qaeda leader Ayman al-Zawahiri said "al-Qaeda in the Indian Subcontinent" would "raise the flag of jihad" across South Asia. India's intelligence and security services are studying the Zawahiri announcement video, which experts said appeared to be a reaction to IS's growing dominance. It was always going to be a challenge for Osama Bin Laden's successor to match his iconic status and maintain al-Qaeda as the most powerful jihadist group in the world. But apart from issuing occasionally long-winded treatises and videos, his critics say he has allowed al-Qaeda to wither while Islamic State (IS) has grown into everything al-Qaeda tried - and failed - to be. While al-Qaeda's remaining leaders hide away in farms and flats in Pakistan, IS has seized and held actual territory. It has the world's attention and despite its sadistic atrocities, it is enjoying a surge in recruitment that Zawahiri could only dream about. Zawahiri said "al-Qaeda in the Indian Subcontinent" would be good news for Muslims in Myanmar (Burma), Bangladesh and in the Indian states of Assam, Gujarat and Jammu and Kashmir, where they would be rescued from injustice and oppression. A BBC correspondent in Delhi says although al-Qaeda has no presence on the ground in India, there is concern that it is trying to reach out to disaffected Muslim youths, especially in Kashmir and Gujarat. Islamic militant groups operating in India are mostly connected to Kashmiri separatists and have links, tenuous at best, to al-Qaeda via Pakistan-based groups. It is not surprising that Zawahiri speaks of Kashmir, Gujarat and Assam - three states where Muslims have been the victims of either anti-insurgency operations or religious riots, our correspondent adds. "In the wake of this al-Qaeda video, we will be on a higher alert. We will work closely with the central government to tackle any threat posed to the state," SK Nanda, the top official in Gujarat's home department , told Reuters news agency. A security source told AFP news agency Madhya Pradesh, Uttar Pradesh and Bihar were also on heightened alert. On social media, Islamic State (IS) supporters mocked Ayman al-Zawahiri's announcement. The scorn felt by IS followers towards al-Qaeda is nothing new, but their derision surged after the declaration, indicating the rivalry between the two groups. One pro-IS Twitter user taunted al-Qaeda for opening "outlets in India" like McDonald's while others felt Zawahiri was "sowing sedition" and trying to remain in charge of all jihadists as their "caliph". Others jeered Zawahiri for being "America's man," saying the United States and Pakistan had "liquidated all AQ's commanders except him". Others likened him to being the "spearhead in the crusader effort against the caliphate," noting he avoided clashing with "Shia Iran" despite allegations of discrimination against Sunni Muslims there. Kashmir, India's only Muslim-majority state, has a long history of violence between separatists and security forces, and has tens of thousands of troops stationed there. The BBC's M Ilyas Khan in Islamabad says Zawahiri's announcement was not entirely unexpected. The Pakistani Taliban (TTP) and some allied Punjabi militant groups have long debated the Ghazwa-e-Hind, or the battle for India, which they say was foretold by the Prophet Mohammad. The real identity of Asim Umar, who Mr Zawahiri has named as the operational commander of the new group, is not known. But there is speculation that a Punjabi militant commander by that name has been based for several years in the town of Miranshah, a former militant stronghold in Pakistani tribal areas near the Afghan border. Asim Umar is said to have set up his own group in Miranshah after spending several years in Kashmir-focused groups such as Harkatul Mujahideen and Jaish-e-Mohammad. He wrote several books on jihad (holy war) and religious ideology, and was considered close to the al-Qaeda leadership in Miranshah, BBC correspondents say.